Owning and successfully running a dental practice is not an easy task. In addition to providing exceptional services to the patients, there are several other elements as well that help in running the dental practice successfully. The point to mention here is the offering services that leave long-lasting impressions and also impact the retention rate. It is most imperative that you offer best practices, remain organized, and run the dental practice along with winning the patient’s hearts. 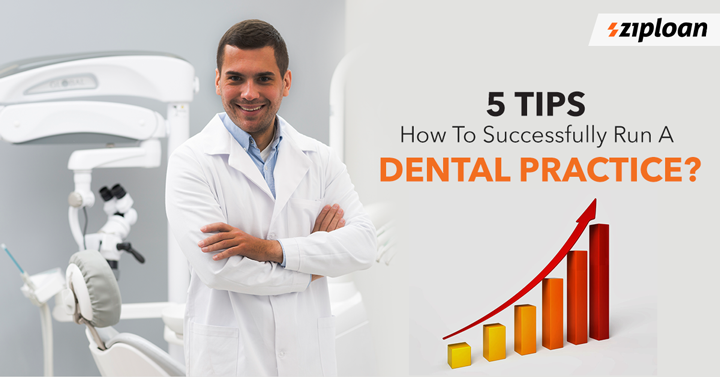 Let’s take a look 5 tips to successfully run the dentist practice. Discover your office/clinic culture even the décor and physical environment. The reason behind this point is that it is your clinic and should display your personality, values, leadership style, behavior, systems, etc. Additionally, you should also consider the way your staff talks to the patients. Essentially, all these factors together show how you run your dental practice. When fine-tuned the office culture, it will boost productivity, attract staff, and also keep the patients coming. When it’s the time to grow patient base, you must think of different ways to add more valuable services in order to give strong competition to your competitors. Maybe you have more potential of serving more patients but the smaller space is the problem. Also, maybe you need to improve the clinic’s accessibility. You can also look forward to introducing a few more specialties. also read: what are the best types of business loans for doctor? You must also offer your patients multiple payment options for their convenience. You can also offer other services, such as insurance coverage in order to help them make sure that their financial circumstances never come in between their health. also read: how can a loan for shop be effectively used? Loyal patients are the most important and there is nothing else more important than that for a dental practice. These loyal customers would visit your clinic regularly with their family and friends. After all, retaining existing patients is as important as converting potential customers. However, retaining customers require convenient hours for them to visit, offer passable service, and an easily accessible location. Additionally, it is also about engaging patients and connecting them on an emotional level and earning their trust. Patient word-to-mouth referral is the best step when it comes to increasing patient base. When a family member, friend, colleague, or even neighbor recommend a specific clinic, the other person is most likely to pay a visit. This is the sole reason why you should give referral its due importance. Having said that, people are busy with their lives and not everyone is interested in supporting your dental practice. So, you will have to look for different ways to ask them for patient referrals. You can either hand out referral cards or offer a referral bonus. Now that you know 5 tips to successfully run a dental practice, you can make the most of it. Additionally, you can avail a business loan for a dental practice is you need additional funding for your clinic to expansion or growth or to buy equipment and machinery. Additionally, you can also register your clinic at the Connect App by ZipLoan for free to build and grow your network. Previous article What Are The Equipment Required For Coffee Shop Business? Next article Why Digital Marketing Is Important For A Hotel Business?